"Interval" training is a technique that combines short periods of high-intensity exercise with longer periods of lower intensity exercise. The lower intensity phase is called "active recovery." The main principle regarding interval training is to raise your heart rate for a brief period of time during an exercise session....ie., "bursts" of effort. The most important factor is how fast your heart is beating, not how fast your body is moving across the ground (ie., in miles per hour). Fartlek training and interval training are similar, but not identical. In the 1930's, the Swedes invented a type of training pattern where exercise intensity is increased for short periods during a training session. They gave it the term "fartlek," which means speed play. For example, during a run, an athlete would increase his/her pace for 1-2 minutes, then drop it back down. These "bursts" of higher intensity effort are repeated several times during a single training session. Interval training utilizes both the aerobic and the anaerobic energy systems. This type of training strategy has other benefits; one of them is that it is less "painful"....not only on your joints, but also on your psyche. You don't need to exercise at a punishing level of intensity for an uninterrupted 30-40 minutes to obtain improvements in aerobic conditioning. Interval training has been used by coaches and serious athletes for decades, but this technique can also help non-athletes improve their aerobic fitness as well. One of the benefits of interval training for non-athletes is that, by limiting the higher intensity exercise to just 1-2 minutes, you can gain an improvement in aerobic fitness (cardiovascular capacity) without making the session too unpleasant. In doing so, you will be more likely to stick with the program and achieve the end result. Healthy, but relatively out-of-shape women entered an 8-week interval training program. 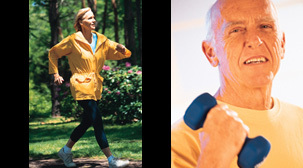 The group had an average age of 47.3 yrs, an average weight of 76.6 kg, and an average BMI of 27.2. Each session involved repeated bursts of jogging on a trampoline alternating with a "relaxation" phase where the subject actually sat down and rested until her HR had returned to baseline. During a typical session, 5 successive bursts of exercise were designed to produce heart rates of 117, 141, 146, 160, and 176 beats per minute, in that order. Each exercise burst lasted no longer than 60 seconds. The total time for each session took about 30-35 minutes. Subjects trained like this 3 times per week for 8 weeks. At the end of 8 weeks, the average VO2max increased 14.8%. Actually, this sounds a little more impressive than it really was because these subjects were not aerobically fit at the beginning of the study: VO2max averaged 25 ml/kg/min at the beginning of the study and increased to only 28 ml/kg/min after 8 weeks of training (Goldsmith RL, et al. 2002). Nevertheless, this study is proof that spending a relatively minor amount of time at higher-intensity exercise can still produce noticeable improvements in aerobic fitness in people who are not aerobically fit. Admittedly, the popularity of interval training was first embraced by athletes, then by weekend warriors. Gyms began offering Spinning classes and "boot-camp" sessions. Programs such as Cross-Fit became very popular. The goals here were to improve fitness and make exercise sessions more fun. But, it turns out that interval training also provides health and medical benefits as well. Prior to the 1950's, patients who suffered a myocardial infarction (heart attack) were put on complete bed rest. It was believed this was necessary to help the heart heal. Today, the exact opposite philosophy is employed: After an MI, patients enter a cardiac rehab program where they gradually increase their walking and jogging pace on a treadmill under careful supervision. It appears the first time interval exercise sessions were employed in cardiac rehab was in 1972: Patients were pushed to ride an exercise bike hard for 60 seconds, alternating with rest periods of 30 seconds. This interval strategy allowed them to exercise twice as long compared to continuous, steady cycling (Smodlaka VN. 1972). One of the best reviews of published research on the health/medical benefits of high-intensity interval training appears in the August 2014 issue of the British Journal of Sports Medicine (see "Weston KS, et al." in REFERENCES below). Much of what I am going to explain here comes from this excellent review. Q: What is the difference between "interval" training and "circuit" training? ANSWER: Interval training is simply a brief increase in the intensity of a specific exercise. 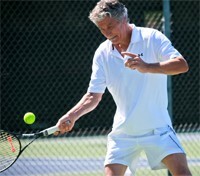 Generally, this technique is applied to aerobic exercises like walking, jogging, and biking. "Circuit" training is much different. Circuit training is an exercise routine where both aerobic and resistance exercises are performed in rapid sequence in a single session. It is usually done in a gym or fitness center since it requires the use of weight-stack machines in order to progress quickly from one exercise to the next. See our separate story on Circuit Training. • Get a check-up. The very first thing to do before embarking on an exercise program that incorporates high-intensity effort is to get clearance from your physician. This is especially important if you have any form of cardiovascular disease, if you haven't exercised for years, or, if you are over 40 years old. • Be creative. If your goal is to add variety to your workouts, there is no magic formula. Alternate between higher-intensity and lower-intensity phases 3 or 4 or 5 times during a given exercise session. As your fitness improves, you will probably be changing your pattern anyway. An example of interval training for someone who does not run regularly (but wants to) might be to walk for 6 minutes at a moderate pace and then jog for 30-60 seconds, repeating this pattern several times. • Monitor your heart rate. Calculate your maximum exercise heart rate. Then, multiply that number by 40-60% if you are relatively sedentary. This would be your target exercise heart rate during the lower intensity phase. During the higher intensity phase, you should push yourself, but, if you are breathing too heavily to talk, then you are working too hard. Interval training is a great way to avoid workout boredom. In addition, not only are workouts often more enjoyable, they go by quicker, and improvement results come faster. If you want a workout that can help you burn more calories, improve your power, and increase your aerobic capacity, then interval training may be for you. 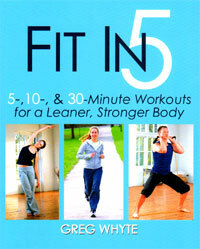 All are good resources, but, of these 3, we liked "Fit In 5" the best.